Bank Zipper Bags & Check Wallets - Otco, Inc. Bank Zipper Bags & Check Wallets - Otco, Inc.
Bank Zipper Bags and Check Wallets are the number one bags used in the banking industry. Perfect for bank deposit bags for carrying cash or checks to the bank or great for promotional bags, school supply bags, medical supply bags or tool kit bags. Zipper bags can easily be personalized with company name or logo with silk screen imprinting or embroidery. Cardholder, imprint, kissing zipper pull tabs, metal zipper, metal zipper with pin-locking pull tab. 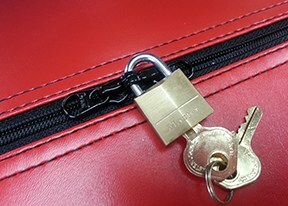 Metal zipper with Pin-locking Pull Tab – Up grade bags to metal zipper and add Pin-locking pull tab and secure bag closed by putting small padlock through loop in pull tab. All bank zipper bags and check wallets are custom made in the USA with hundreds of options of size, material, color, lock, and can be personalized with company name or logo. Bank zipper bags and Check Wallets are Custom American Made with many choices of material, size and colors. They are perfect for any office or home use. Zippered bags are useful for transporting checks, currency, receipts and other office/school supplies. Each zipper bag is a value for the money and cleans up easily making it the perfect choice for retail stores, hotels, restaurants, delivery services, schools, promotional bags, and offices including government and law enforcement.